The 2GIG GC3 is an 3-1-1 (3 contacts, 1 motion detector, 1 keyfob) wireless Verizon LTE cellular Alarm.com security system kit that offers up to 100 wireless zones, 100 user codes, and 7" built-in touch screen display. The GC3, is the thinnist all-in-one security system panel on the market to date. This 2GIG GC3 kit is well suited for houses, apartments, condominiums, or commercial buildings due to its scalable solution for properties of all sizes. 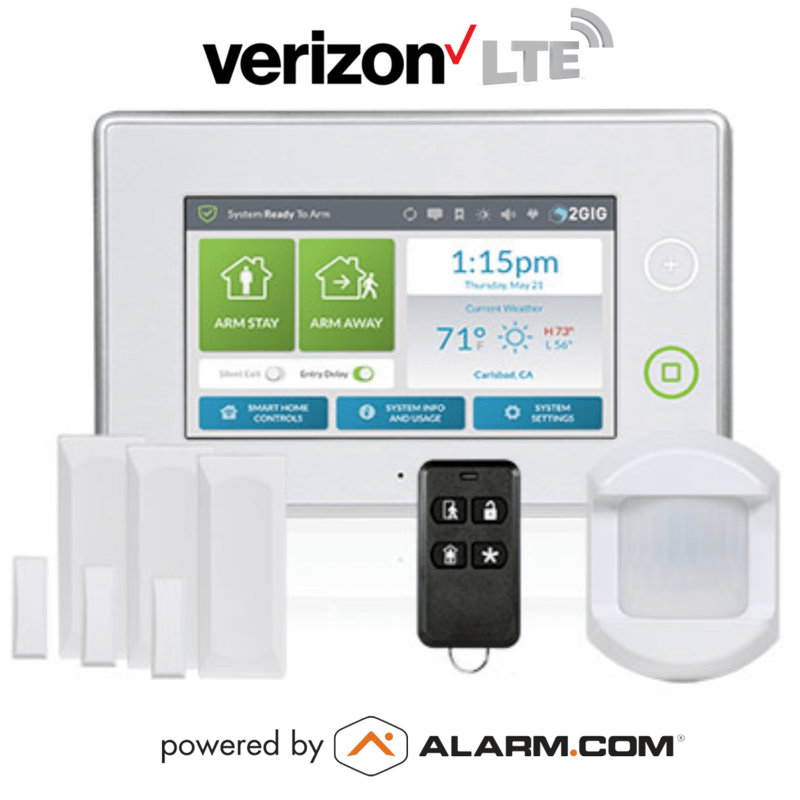 Choose to send the alarm signals without wires over the wireless cellular Verizon LTE network and get Alarm.com's interactive features that support off-premises control to arm and disarm the system, check system status, activate no-entry delay, or activate the latchkey features. The GC3 has two new custom featured buttons called "Rooms" and "Bookmark" that permit users the ability to group commonly used smart home controls on to one screen for quicker control. In particlular, the "Bookmark" button feature specifically allows the user to create a customized default home screen for the room. The panel supports convenient system operation from anywhere within the premises with the use of wireless two-way talking touch screens and/or touchpads. Three door/window contacts, one pet-immune motion detector and one keyfob (four-button version) are included in the GC3 (3-1-1) kit for convenient local system control. In addition to using the GC3 as a burglar alarm system, connect up to 232 wireless Z-Wave® 500-Series devices to provide smart home control over other functions for added convenience. These devices include lighting control devices/switches, thermostats, garage door sensors, door locks and more! 2GIG GC3 can send messages to the GEOARM central monitoring station using the universal Contact ID (CID) format. The GC3 can connect to GEOARM's central station to be professionally monitored and controlled by the user from anywhere using smart device or web browser. Or, you can choose our DIY alarm monitoring services route, and self-monitor your property. GEOARM provides the expertise and support to ensure your DIY security installation goes as smoothly as possible. The 2GIG GC3 security system offers home automation and security protection for homes and businesses. The GC3 control panel can be professionally or self-monitored 24-hour a day for fire, smoke, or carbon monoxide detection. • Remote Control Options - Always be in control by remotely managing your system from a computer or web-enabled mobile phone (iPhone, Android, etc. ).